Visit Wal-mart's website at www.WalmartContacts.com to buy contact lenses at the everyday lowest cost and the most convenience to you. Get Free Shipping of your contacts to your home when you purchase a year supply. Retinal photos included with Well Care exam to Screen for Medical Retinal Diseases. Digital Retinal Imaging - High Resolution photos of the interior surface of the eye for the diagnosis of conditions such as diabetes, glaucoma and macular degeneration. 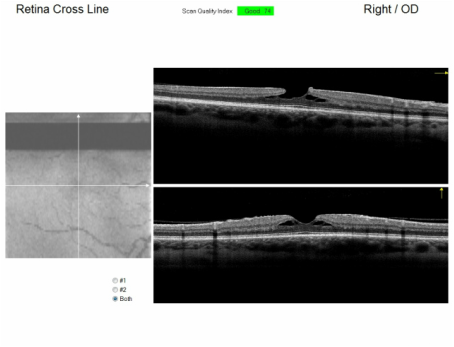 OCT - Optical Coherence Tomography is effectively "optical ultrasound" imaging which provides cross-sectional images of the eye. OCT is useful in the diagnosis of macular degeneration, diabetes, glaucoma, retinal disease, etc.